I am a sucker for mint and chocolate ANYTHING! A chocolate mint cheesecake? Get out of my way! I am soooo there. I totally jumped on this recipe the minute I saw it. Total Time: 6 hr. 30 min. Combine stellar flavors in a Chocolate Mint Cookie Cheesecake. 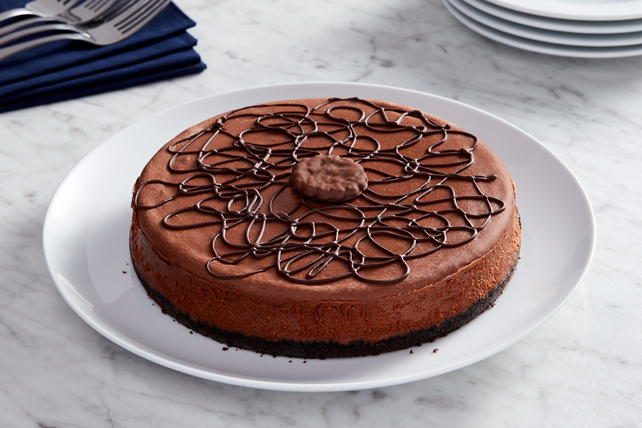 The cookie crust of our Chocolate Mint Cookie Cheesecake gives this recipe a great crunch. Reserve 1 cookie for garnish. Finely crush remaining cookies; mix with butter until blended. Press onto bottom of 9-inch springform pan. Melt 6 oz. chocolate as directed on package. Beat cream cheese, sugar, vanilla and peppermint extract with mixer until blended. Add melted chocolate; mix well. Add eggs, 1 at a time, mixing on low speed after each just until blended. Pour over crust. Bake 55 min. to 1 hour or until center is almost set. Run knife around rim of pan to loosen cake; cool before removing rim. Refrigerate cheesecake 4 hours. Melt remaining chocolate; drizzle over cake. Garnish with reserved cookie. Want the full nutritional details? CLICK HERE to check it out at Kraft Recipes. I’ll share a secret with you. When I’m picking out a character who would make the Tuesday Treat I’m sharing, it’s not always easy. The moment I saw this recipe, Sade was jumping up and down demanding a taste. No way would she make it, but she’d find someone to make it for her! Sade Marquis might be a hotshot FBI agent and have no trouble dealing with the supernatural things that go bump in the night but put her in a kitchen? She’s been known to burn water. Seriously! Still, this treat is right up her alley. Caleb, her werewolf partner, has mentioned that she’s been known to buy out the entire supply of Thin Mints Girl Scout cookies. If you’d like to read more of the Urban Fantasy adventures of Sade and her gang, you can start with THAT OL’ BLACK MAGIC, the first book in the Penumbra Papers, which happens to be on sale at ALL on-line retailers for 99 cents! Just click on the cover for more information. This entry was posted in Writing Life and tagged books, characters, food, fun stuff, links, Penumbra, reading, recipe, series, Tuesday Treats, urban fantasy, writing. Bookmark the permalink. I can totally see Sade scarfing this down. Sinjin would be well advised to pay someone to keep her in an endless supply of these.